We are located in the south of Bahia State, 15km from Itacaré. The nearest airport is Ilhéus (IOS), 60Km from here. It is served by most of the international air companies. Daily flights from Salvador, Rio de Janeiro, Vitória, Brasília, Belo Horizonte and São Paulo to Ilhéus are covered by the Brazilian companies TAM, GOL, AZUL, TRIP and AVIANCA. We can organize a taxi from the airport to Pedra do Sabiá – R$160,00. The closest international airport is in Salvador (SSA). There is a paved road (BA-001) that directly links Ilhéus to Itacaré following the coastline. Coming from Salvador, the best way is to get the ferry-boat to Bom Despacho (Itaparica Island) and to continue on the BA-001 road to Itacaré. On the BA-001, close to Itacaré, take the dirt road towards Taboquinhas. After approximately 5km, turn right as you see the Rosa dos Ventos school by the side of the road, where the Reserva Pedra do Sabiá sign is shown. Keep going inside the farm until you get to the Rio de Contas bank. There are hourly buses from Bom Despacho (Itaparica Island) to Itacaré. The journey takes approximately 5 hours. Águia Branca and Cidade Sol are the most direct and quickest bus companies. There are also buses leaving daily from Ilhéus, (07:00 AM to 07:00 PM) by the Rota company. Travel time is 1h40. There are other bus lines to Itacaré from Porto Seguro, Itabuna, Vitória da Conquista, Feira de Santana and the main cities around. 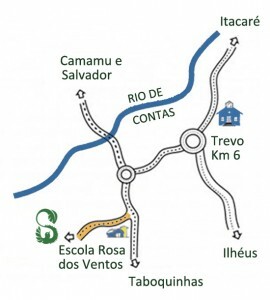 From Itacaré bus station, get the bus to Taboquinhas (it stops in front of the farm entrance) and get off at the Rosa dos Ventos school, then keep walking for 2,5 km. *Don’t forget to bring a flashlight, hat, swimsuit, raincoat, boots for forest hikes and natural insect repellent.